Sky high gas prices along with sluggish economic conditions have severely impacted our tour business for over a year. We have reluctantly decided to suspend our tour operations for the time being. Our sincere thanks and appreciation to all who continue to support us. 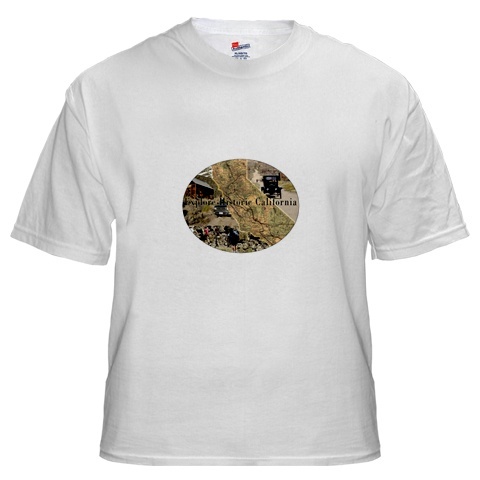 Explore Historic California with our logo depicting the California backcountry and its rich history both true and farce. We now offer shirts, sweats, jerseys and cups with our logo. Click the shirt for details! Friends of Last Chance Canyon is a new organization interested in sustaining and protecting areas within the El Paso Mountains, near Ridgecrest, California. The main focus is preserving and protecting historic sites like Burro Schmidt's tunnel and the Walt Bickel Camp. Please click on either logo to visit the FLCC site. The Panamint Breeze is a newsletter for people who love the rough and rugged deserts and mountains of California and beyond. Published by Ruth and Emmett Harder, it is for people who are interested in the history of mining in the western states; and the people who had the fortitude to withstand the harsh elements. It contains stories of the past and the present; stories of mining towns and the colorful residents who lived in them; and of present day adventurers. Subscriptions are $20 per year (published quarterly – March, June, September & December) Subscriptions outside the USA are $25 per year. All previous issues are available. Gift certificates are available also. To subscribe mail check (made payable to Real Adventure Publishing) along with name, address, phone number & e-mail address to: Real Adventure Publishing, 18201 Muriel Avenue, San Bernardino, CA 92407. It's always FIRE SEASON! Click the NIFC logo above to see what's burning. 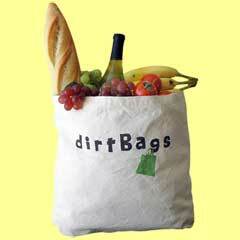 Click on the bag to find out how. Visit Michael Piatt's site, www.bodiehistory.com, for the truth behind some of Bodie's myths. Terri Geissinger is a Bodie area Historian, Guide and Chautauquan. A long time resident who lives in Bodie and Smith Valley, she is dedicated to preserving stories of the pioneer families, miners, ranchers and teamsters. Click the photo for information on her tours with the Bodie Foundation. Back to the past in California City--Wimpy's! The nation's economic downturn has severely affected the newspaper industry. My job of nearly 30 years was eliminated several months ago. I'm actively looking for full or part time job opportunities within my diverse skill set. If you have, or know of any openings, please contact me through this CONTACT link. Not too many years ago, the family station wagon was the magic carpet to adventure. Today, that family station wagon is likely to be a four wheel drive sport utility vehicle or pick up truck. 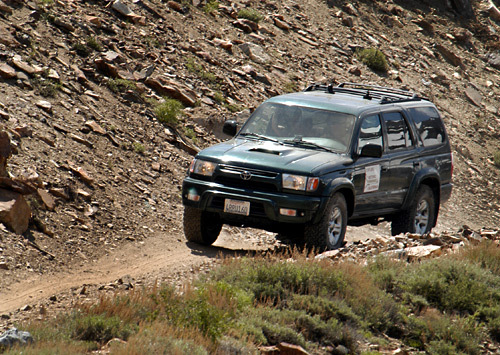 SUV's and other 4x4's are one of the best selling classes of vehicles. Ironically, industry statistics show that once purchased, few owners will dare to drive their vehicles off the paved highway. 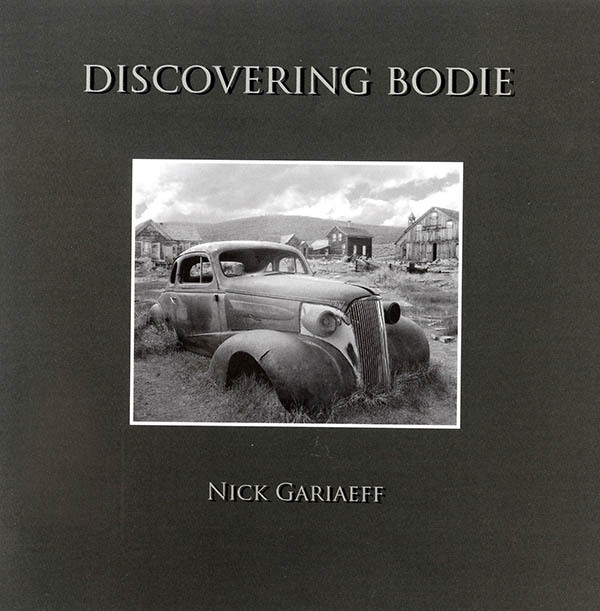 Nick Gariaeff spent a good portion of his life wandering up and down the dusty streets of Bodie, California artistically recording what he saw through his camera’s eyes. No matter how many times he visited, he couldn’t get enough of the place, and always found himself going back for more. He made no effort to look through the history, just photographing seemed to be enough. Then one day, the ghosts of Bodie nudged him, and he was compelled to know more about the former residents of the abandoned old mining town. Among the ghosts that nudged Nick, was Lottie Johl, the prostitute who was made respectable by the town butcher, Eli Johl. Her romantic story and rivalry with Annie Donnelly, the wife of Eli’s business partner, is well known and portrayed in modern day Bodie State Historic Park. Her tragic death, recorded in the Bridgeport chronicle on November 7, 1899 confirmed an overdose of poison, but several gaps appeared in the history books that Nick rummaged through. Lottie’s house stands in Bodie, with remnants of what may have been her furniture inside, providing a haunting look at where she spent the last years of her life, and where she took her last breath. The Miner’s Union Hall, now the Bodie museum, contains portraits of Lottie and a landscape she herself painted, next to her rival’s artistic works. The floors that creak and moan while hundreds of visitors walk across them each season once creaked and moaned as Lottie and other town folk danced in the finest costume of their day. Lottie’s grave, overgrown and unmarked amongst the desert brush and wildflowers, is well known to everyone who loved her then and now. As Nick visited these spots with new respect for what stories they could reveal, Lottie’s spirit and those of many others surely reached out to him and lead him to countless hours of newspaper, genealogy, and archival research. Lottie came into this world as Charlotte J. Wilson, the daughter of Nancy Ann Swearengen, and George W. Wilson. The year was 1853, and the place was Keosauqua, Iowa. She grew up on a farm in Farmington, Iowa, and lived there with her parents and sister, Mary. Lottie’s mother went on to marry two more husbands after George, never leaving Keosauqua for very long. When Nancy died at the age of 84 her obituary neglected to mention her first husband, George, and her daughters Mary and Lottie. The first fifteen years of Charlotte’s life are virtually unrecorded. A marriage license appears on December 12, 1868 in Van Buren County, Iowa. Charlotte Wilson’s name was signed on the license, beside Newton Robert Calhoun’s. Apparently, the marriage certificate itself was never recorded but the couple lived together, bought and traded properties with Calhoun family members, and eventually produced a daughter. The daughter, Mattie Mary Calhoun came into the world on April 22, 1870. Six years after the daughter’s birth, the little family found themselves in Calaveras County, California. A year after their arrival, the Calhoun’s split up. Lottie would next appear in the mining camps of Nevada. Elias Johl was born on July 14, 1842 in Rust, Germany, near Baden-Baden. He followed the eldest of his thirteen siblings to America in January of 1865. Other family members went with him, and primarily settled in the South. Eli, however, found his way to Nevada and the mines. In 1870 he landed in Mineral Hill where silver deposits had been discovered the year before. Here, Eli worked as a butcher in a town that swelled to a population of 400. As the silver played out in 1873 and Mineral Hill went to the ghosts, Eli followed the call of silver to Belleville and Candelaria. The Candeleria newspaper, The True Fissure, advertised Eli Johl and John Goodwin as proprietors of the Candelaria Meat market. Eli also shared proprietorship of the popular Bellevue Hotel with Sheriff Clemm Ogg. The hotel was noted for it’s large ballroom and elegant bar where holiday parties were often held, including Eli Johl’s own wedding to one Miss Lottie Calhoun. In addition to the hotel and meat market, Eli continued successfully prospecting for silver. Last Monday evening at Belleville, Eli Johl and Miss Lottie Calhoun were joined in the bonds of wedlock. A large number of personal friends of high contracting parties were present, and after the ceremony wine flowed like water. The bride was elegantly and tastefully dressed in a lavender silk trimmed with bands of velvet of a darker shade, fringe of balls and tassels, and the whole finished and enriched by light corn colored lace. The toilette was extremely rich and becoming. The bridegroom wore the usual regulation black with white vest. A feature of the festivities was the visit at a late hour of ten or a dozen masquers who added much to the hilarity of the occasion by their antics. At a late hour the company withdrew, but on the following day and evening the festivities were renewed, the many friends of the newly wedded couple vying with each other in having a good time. The True Fissure July 9, 1881 Candelaria, Nevada. Where and how Eli and Lottie Calhoun were introduced to one another is unknown. In his search for more information, Nick Gariaeff dug up an old 1880 Candelaria census. There was no mention of a Charlotte Wilson, or Lottie Calhoun, but the name Lottie Roberts stuck out like a sore thumb. Lottie Roberts lived a block away from Eli’s meat market with Lulu Gordon at Lulu Gordon’s Dance Hall. At this point Nick remembered that Lottie’s first significant other was named Newton Robert Calhoun. It’s highly conceivable that Lottie took his middle name as her own last name when she went into prostitution. Further background on Lottie Roberts showed her living in Reno, Nevada, before she moved to Candelaria. An old Reno Evening Gazette advertised a Saturday night “Social Dance” at Lottie’s Lincoln Avenue address. At a later date, when Lottie Roberts moved from this address, the landlord filed a complaint against her for stealing the bed sheets. On November 8, 1879, Lottie was dubbed by the same Reno newspaper as “Naughty Lottie” when “Wicked” Charles Gray robbed her of $1,520 worth of money and jewels. Several years later, Wicked Charles turned up in the Bodie newspapers, when he was arrested for battery of a “lady well known in Bodie” who demanded payment for breaking her jewelery. Could this be further evidence that Eli Johl’s wife was the former “Naughty” Lottie Roberts? The Johl’s marriage took place on July 4, 1881, a few months after Eli gave up his partnership in the Candeleria Meat Market. A house behind his Belleville Hotel, became their first home. Before the marriage, the couple had recorded claims in the Garfield Mining District for several mines, including the Lottie, which was named after her. The successful miner and business proprietor and his former prostitute wife had not been married more than a year when tragedy began to strike. Bad blood between Eli and mining partner J. C. McDonald showed up in newspaper headlines when Eli opened fire on McDonald with a double barreled shotgun following a day of altercation and unwelcomed entry by McDonald into the Johl’s Belleville house. Three months later, on September 10, 1883, a fire burned down the Bellevile Hotel and their house. Somehow the Johl’s managed to salvage doors, windows furniture and a few other items then moved to Bodie. By the next year, Eli was selling mules, wagons, and mining equipment, and working at the Union Market. In spite of modern traditions touting the Johl’s romantic meeting at a Bodie dance hall, subsequent marriage, and failed attempts at acceptance into Bodie society, Eli and Lottie celebrated many happy times when they arrived as Mr. and Mrs. in the booming mining town. Newspapers of April 1886 boasted “A BODIE BELL IS REMOVED FROM OUR MIDST” but it was it was Lottie’s daughter, Mattie Mary Calhoun and her fiancé William O. Toon who were joined in union complete with wine of various varieties, liberal toasts, and a banquet of oysters, ice cream and coffee, in her mother’s Bodie home. There is no doubt that Eli Johl and Charles Donnelly were partners in business and society. In addition to the butcher shop and meat market, Charles sponsored Eli as a member of Ancient Order of United Workmen, and the Knights of Pythias. Charles wife, Annie, may have shunned Lottie and tried to make her life miserable, but Bodie newspaper clippings commonly described the Johl’s as the “couple” of the ball. The Johl’s not only appeared to have a happy and healthy social life in Bodie, but they amassed wealth and property as well. Nick Gariaeff’s searches lead him to the Mono County personal property tax archives. 1887: watch $25, furniture $40, piano $75, sewing machine $10. In addition, records showed the Johls owned a number of mining claims, including the “Little Stringer” which pulled out at least 20 tons of ore.
Lottie’s death in November of 1899 was indeed the talk of the town, with accidental poisoning listed as the cause. Town gossip and Reno newspapers insisted that Lottie had committed suicide. Regardless of what or why, Eli was devastated by his beloved wife’s death. 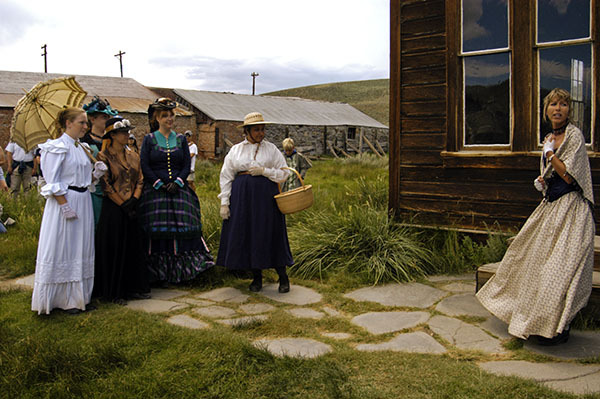 Terri Geissinger (right) portrays Lottie Johl being tormented by Annie Donnelly and other society women in front of the Johl house on Main Street at Friends of Bodie Day, 2005. An article by Nell Murbanger in the October, 1960, issue of Desert Magazine describes the turmoil surrounding Lottie's burial. "Rosa May, pert, pretty and popular —at least with the men—was given a reasonably good position outside the fence, while Lottie, a "fallen" woman who had later married Eli Johl, Bodie butcher, and lived with him respectably for many years, won a place inside the fence—but only after a hassle that threatened to split the town. Those seated in judgment at last grudgingly agreed to her burial in hallowed ground, but only if she were buried in the farthest-out grave of the "respectable" section." A photograph more recently unveiled in Terri Geissinger’s Images of America Bodie 1859-1962 from Arcadia Publishing, shows Eli at Lottie’s grave, a little snow still on the ground, unidentified children nearby, her portrait hanging on the fence and the gravesite decorated with trees and flowers. What was recorded in the newspaper as a simple spring outing, was probably a trip to Bodie to settle Lottie Johl’s estate, as she had $2,000 worth of property still in her name. A few weeks later, on April 18, a petition was made to the Superior Court by Eli for Lottie’s property. By April 30, the petition was granted because the property was community. 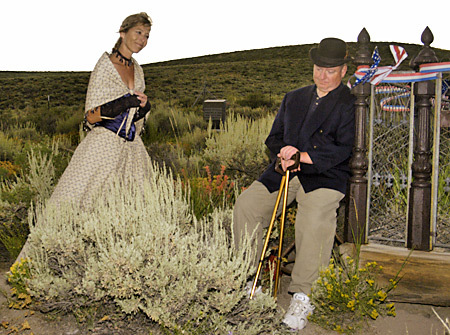 Terri Geissinger and Dave James portray Lottie and Eli Johl at Lottie's grave in the Bodie Cemetery, 2005.
residents of Bodie also speak through Nick, and reveal their tales. 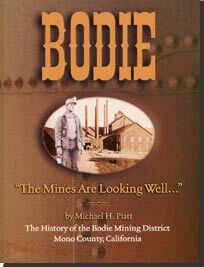 The book is available at the Bodie Museum or at www.bodiefoundation.org for online or phone ordering. Special thanks to Nick for taking time off from his photography to listen to what the ghosts of Bodie had to tell and to research it for authenticity. It was a pleasure for this author to meet him at this year’s Friends of Bodie Day, and obtain to permission to reveal his findings on the Butcher of Bodie and His Bride. CERRO GORDO IS OPEN AGAIN TO VISITORS! Cerro Gordo's American Hotel (center) and nearby buildings are surrounded by a blanket of snow. 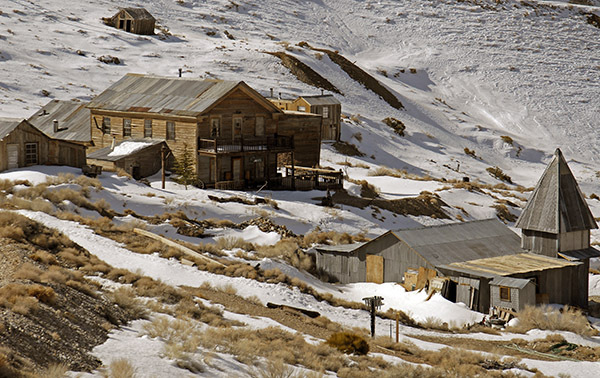 The ghost town of Cerro Gordo is again open to day visitors! Cerro Gordo is again welcoming day visitors, road and weather conditions permitting. The town is open during daylight hours. A full time caretaker is living at the site and visitors must check in before venturing in the ghost town. No supplies or accommodations are available at Cerro Gordo and visitors should bring plenty of drinking water and haul out their own trash. The dirt road from Keeler to Cerro Gordo is a steep, eight mile ascent. Four wheel drive is not usually required, but adequate ground clearance is. Stay tuned to this website or our Facebook page for updates on Cerro Gordo's status.